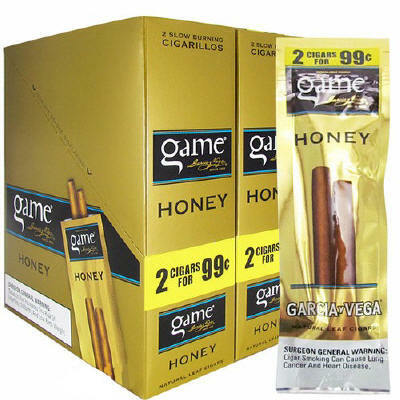 Game Honey Cigars 2 for 99¢ Cigarillos 60ct why not go for the Gold! Game Garcia y Vega cigars were introduced in 2007 as a line extension to the original top-selling Garcia y Vega brand. Game Honey Cigars 2 for 99¢ Cigarillos 60ct are made with natural-leaf wrappers and are packed in resealable pouches to maintain freshness. Available in a variety of the most appetizing flavors, Game Garcia y Vega cigars are very tasty, mellow in body, and overall, a great smoke with budget-friendly pricing. These sweet-smelling enjoyable Cigarillos have gained enormous popularity over the years and are sure to be a big hit with your customers too.